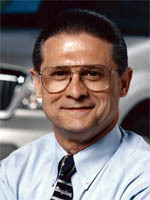 Mr. Roman J. Krygier, Jr., served as Group Vice President for Global Manufacturing at the Ford Motor Company from 2001 until his retirement in 2006. He received a BSME from Purdue in 1964 and a master’s degree in management in 1974 from MIT. After earning his undergraduate degree from Purdue, Mr. Krygier began his four-decade-long career at the Ford Motor Company as a trainee foreman in their Chicago training plant. The company would later offer to send him to MIT as a Sloan Fellow, where he learned about the financial aspects of business through coursework in labor management, financial controls, and standard costing systems. Upon returning from MIT, Mr. Krygier was the Assistant to the Operations Manager of Ford’s stamping operations. His assignments there related directly to cost management systems and budgeting. In 1977, he moved to the Buffalo stamping plant to serve as Plant Manager, taking on the role of managing an operation independently for the first time. He led the turnaround of the operation and ultimately earned a promotion to become manager of all United States operations. Mr. Krygier was named Assembly Operations Manager in 1992, where he oversaw the process of finishing the production of vehicles for the entire company. In 1994, he was named executive director of Advanced Manufacturing Engineering and Process Leadership, Ford Automotive Operations. Mr. Krygier worked on the Ford 2000 initiative, which globalized and standardized processes and operating methods. He led the development of the Ford Production System, which redefined the way that Ford facilities operate. Throughout his career, Mr. Krygier was dedicated to employee involvement and safety. In addition to spearheading Ford’s flexiblemanufacturing systems, he served as the company’s executive sponsor for worker safety, overseeing an improvement in safety statistics of over 90 percent during a six-year time frame. Mr. Krygier also gained the distinction of being a coach and mentor to other Ford employees. He served as the lead negotiator for the 2003 United Autoworkers contract with Ford along with Ford’s vice president for labor relations. Mr. Krygier was part of the Engineering Advisory Council at Purdue in 2004. He was recognized with the Distinguished Engineering Alumnus Award from the College of Engineering in 2006 for his outstanding leadership and vision in global automotive manufacturing and management.